Footballers of all ages have taken part in three-day coaching course thanks to Wrexham Glyndŵr University. 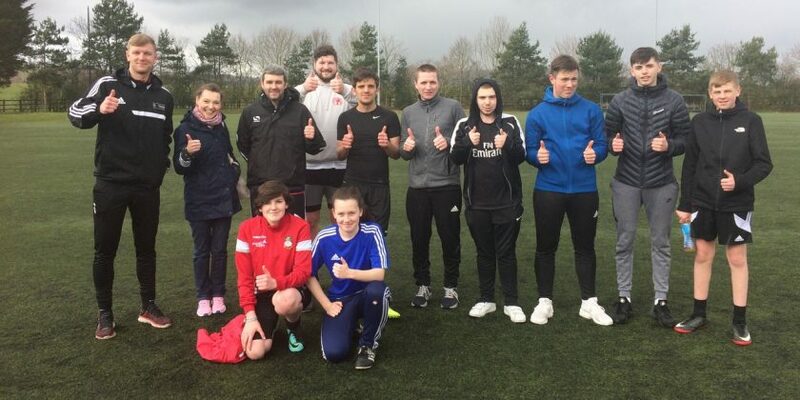 The university ran its Easter Football College last week, with fifteen men and women aged between 16 and 41 taking part in a series of workshops and coaching sessions. Held at the Wrexham Glyndŵr University sports hall on the Plas Coch campus and at the Colliers Park training ground, which has previously hosted the Welsh National Football Team and FC Barcelona, the sessions were open to anyone 16 or older anyone living in Wales. A range of skills were examined by those who took part, including coaching and planning, community sport development and the use of sport in building relationships. They also joined in with a workshop on mental health in football and a session of Techniquest ‘Bodyworks’, which looked at how exercise affects the body, the role and structure of the skeleton, and the impact of sugar in foods. The three-day event was organised by Wrexham Glyndŵr University’s Widening Access team in association with Chris Hughes from the University’s Sports department. Widening Access co-ordinator Sarah Gaffney said: “Sport is a great way to encourage community development – and great coaches are at the heart of that work. “The Easter Football College was designed to help give people a taste of that work, and to celebrate our ‘Football Coaching and the Performance Specialist’ course. More information about the Football Coaching and the Performance Specialist BSc (Hons) course can be found on the Wrexham Glyndŵr University website.